Because this was a Ludum Dare Game, the theme for the game jam was “Tiny World.” This worked out for me as I already had some ideas that fit in nicely with the theme. I wanted to make a game about someone who could only rearrange what he had and never create something new. In terms of the theme, this meant that this person’s perspective was limited and that even though he could control everything he had, he would never be able to see what was outside of this. Hence, from the outsider’s perspective, they could said his perception of the world is tiny. The idea for this game arose from discussion with a friend and my own personal experiences. I started off looking at a 16×16 canvas on the computer and thought about how I could express this idea visually. Eventually I thought about the idea of rearranging blocks in a certain configuration, perhaps some kind of matching game. Looking back at this idea I may try and extend off of it but at the time I felt like it wasn’t working. However I did like the idea of being able to edit blocks and move them around. The idea also came up to just restrict the game size to 128×128 pixels. I would be literally interpreting the theme while also expressing the idea of someone’s subjective view of the world (I later scaled up the game to 256×256 for playability purposes but that’s still a pretty small size). 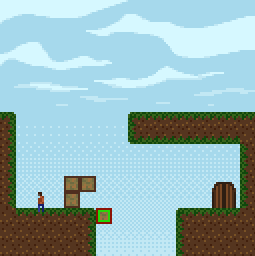 I first had some placeholder art with blocks and implemented the mouse and block controls. Because the canvas was small, it made sense to me that this was the space the character existed in. This led to the ability of the character to wrap around this stage. This meant if the player walked off the screen, they would find themselves on the other side of the screen. I also decided to not have the character in the game able to jump; the player would have to “fall” through the bottom of the screen in order to get to the top of the screen. After that I decided to do some level designs. I introduced the core concepts in the game one by one, first with wrapping around the level in the horizontal direction and then the vertical direction. After that there were some initial stages with block editing. At this point I started to experiment with some puzzles with the block editing. I also realized at this point that it was possible the platforming aspects of the game might have been overshadowing the main mechanic of block editing. So this was a problem. I felt that the puzzles I was developing were weak because they had an emphasis on the platforming rather than the block editing. I also felt that the block editing didn’t really make good puzzles. In reality, every level only needed one of two blocks. If you needed to fall somewhere and couldn’t reach it, all you needed was one block to land on to get closer. If there was a gap the player needed to cross, they could just use two blocks. When the character is standing on one block the player could move the second block in front of them and then repeat this process over and over until they crossed the gap. Did I even need the mechanic of editing blocks? How did this mechanic even express my main idea? After rethinking some of the levels I found that I could retool the problems I had into the story and progression of the game. I also tried to resolve the block-editing puzzle problem by adding places where you couldn’t place blocks to add variety to the puzzles. These non-place-able areas began to represent things the character couldn’t understand that other people probably did. While I was building these levels I also did the art. When I was finished with the levels I added the sound and music. Overall the level progression in Controlling represents a cycle of thought in the character’s mind. The story in the game is also expressed by text in the beginning of some levels. First, the character feels like he is in control and has an understanding of the world around him. This is represented by the wrapping around and the block-editing. However there are things the character doesn’t understand, and he grows frustrated. This is represented by the non-place-able blocks. He tries to overcompensate his lack of understanding with more blocks, but this only ends up hindering the way out. This is represented in levels where the player has to move blocks out of the way and try to find the door. Eventually the character feels like he is lost and thinks about why he’s having so much trouble. This is represented in the game by harder block puzzles. However instead of realizing he’s missing something, the character reassures himself that he is special. This is represented with easier block puzzles and eventually the first stage of the level. This assumes that the character is constantly playing through these scenarios in his head but never learns or moves on (Hence the THE END? with the question mark). Before I finalized my submission to the Ludum Dare website I playtested with fellow ETC student Scott Chen (not the one in Scott Told Himself) who gave me some feedback on the level design and visual elements. After some tweaking I was able to submit the game in time for the 48-hour game jam competition. Workflow/Scope: I was able to get things up and running pretty smoothly. I didn’t feel extremely rushed within the 48 hours time period and finished in time. Playtesting: Though I was only able to playtest with one person (Scott), he clarified a lot of the issues that I felt were in the game and was able to put enough tweaks into the game that made the game much more playable. Brainstorming: I probably should have kept thinking about possible mechanics that expressed my idea better. In the future I will probably avoid platformers because it sets the game too much in a genre that I feel has already been explored a lot by many developers. Mechanic w/ Level Design: Because I went ahead with the mechanic I had trouble planning out the levels and sort of hit a dead end. I felt like I had fully explored the mechanic but it didn’t reach a point where the mechanic felt deep enough for the player to really grasp what was going on. I had some narrative/text to help convey the message similar in the fashion of “Company of Myself” by 2Darray, but it felt formulaic for me. Overall I am okay with how Controlling turned out. It feels like a complete experience (other than some bugs). However I feel that if I were to continue with this idea I would probably rethink the mechanic and try something more experimental. I feel like the mechanics in the game did express my idea but because the mechanic felt weak (at least to me personally) for level/puzzle design the meaning couldn’t be expressed as well as I wanted it to. This entry was posted in Postmortems, Project 6: Controlling. Bookmark the permalink.